This kitty face is pretty cute, too! My daughter did a lot of happy squealing when I pointed them out to her. So fun! I had the hardest time deciding on a back for this quilt, but I found this small gray print that tones down the brightness of the front quite nicely. I quilted it with an all over stipple in gray thread and it's bound in a gray solid, too. Hurray for gray! The quilt measures 60" x 75". This is only my second (non-mini) quilt finish of the year. Can you believe it??? I need to get crackin'! This quilt is SO cool! I do love the backing too. I can relate to the sense of accomplishment. My submission for FIUF is my first non-mini, non-bag finish since last October. Eep! 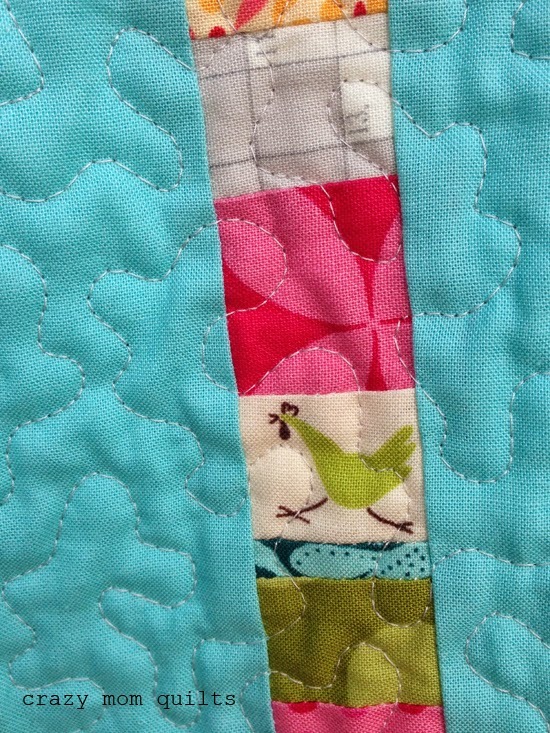 This is such a happy quilt, and the fussy cuts add to its charm. I can see why you're already dreaming of a third version of this lovely. Beautiful color palette, I imagine it will look great in neutrals too. Wonderful colours, and great fun with the tiny pieces. 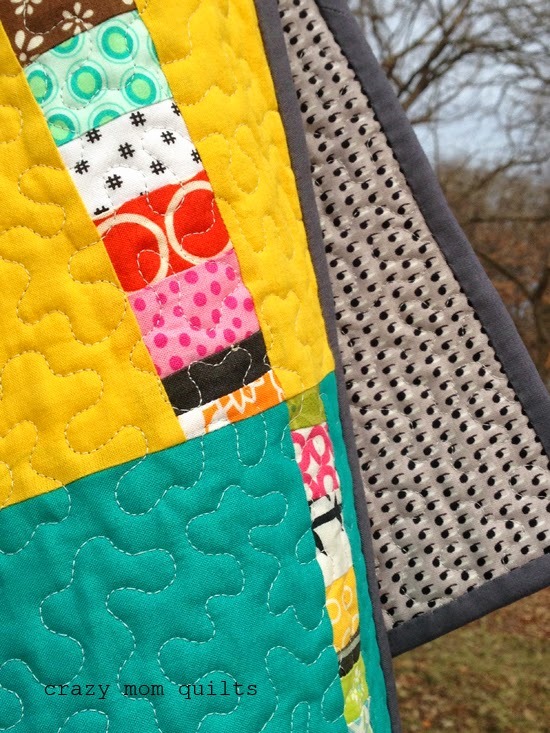 The meandering FMQ is my favourite for texture on a brightly coloured or scrappy quilt. Would you like to join in on the FMQ linky on my blog? No real rules, it's all about doing your own thing. 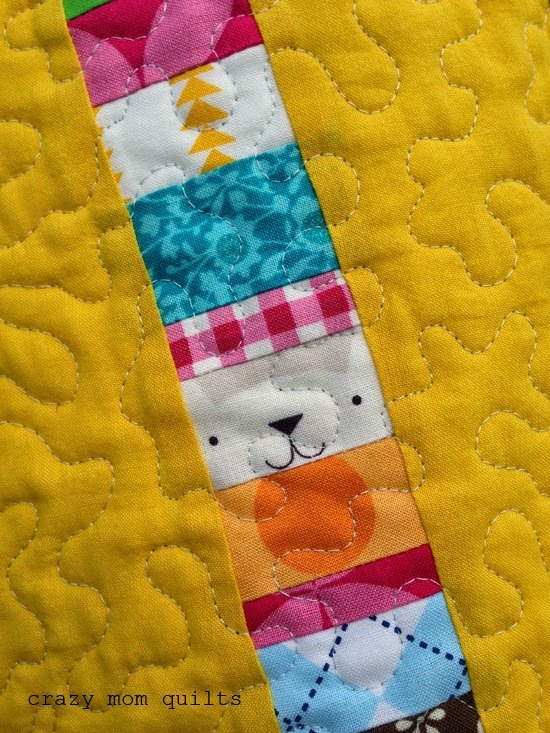 So cute to see the details of those scraps--that little polar bear face is adorable! little tiny scraps are SO fun! that chicken is so adorable! I don't suppose you know the name of the fabric it came from?? Congrats on a big finish! Only second? Say it isn't so!!!!!!!! The little rooster/chicken. I have that on a bag and I just love them every time I see them! beautiful ! I have to hand it to you - I would surprise myself if I ever made the same pattern twice ! Love this quilt! I definitely want to make one... someday. I really love the bright colors for the backgrounds. And I love looking at all those little snippets too. I have only finished sketchbook pages this week, but I'm excited to be sewing today! such a great finish and really wonderful use of those bitty scraps! we just bought a mountain cabin and it's going to need a LOT of quilts for snuggling. i think this pattern would be fun and perfect for just that. happy friday! This pattern is on my "summer bucket list!" I love the bright colors and I have a thing for birch trees... I might need to start sooner than I planned though. LOVE THIS. Such an incredibly beautiful quilt to show off! What a great finish - in every way. This pattern has just jumped onto my bucket list!!!!! Just loved seeing it. Really enjoyed your talk at Rochester Quilters' Society Monday eve. I bought you book and am having a great time making quilted storage boxes from scraps. Thank you. I love how the first photo of it quilted contrasts with the i quilted one. Quilting gives it depth, demintion and a grab me, cuddle me use me appeal! This turned out so good and I love the bright backgrounds as well as the little details as well! Cute on the chicken! haha. These always look fun to make! I should make one! I love the brightness and those adorable fussy cuts! The grey works so perfectly too :) I seem to be on a run of small finishes and need to get cracking on the big ones! Love the chicken and the kitty. And the tiny flying geese. Oh, my! I love this pattern in bright colors, but it would be neat to see it in neutrals, too. So lovely. It turned out SO great. Beautiful quilt, I'm planning on starting one soon. I'm sure it will be a super fun quilt to work on. What a happy quilt. And those fussy cut chicken and cat face are squeal worthy for sure. What a happy, cheerful quilt. Great colours. I knew there was a reason why I kept every little scrap! Looks beautiful. absolutely gorgeous! I want to make one just like this! Love your quilt! Your quilting thread color was perfect! It look gold, teal, pink, depending on the background color. Blends in amazingly. 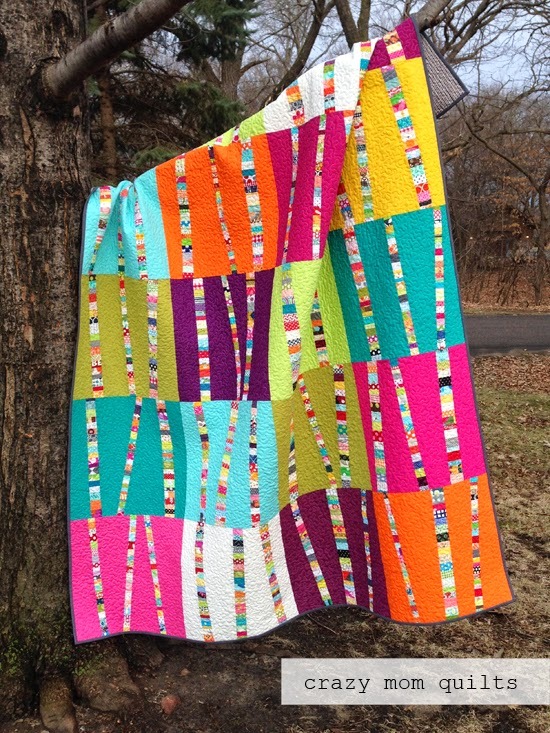 Congrats AmandaJean on a wonderful finish - LOVE this quilt! Did you see the neutral version of this that Aurifil was sharing. Saw in on FB. Totally different, but I love your brights. Beautiful quilt! I have this pattern from when you SO SO generously gave each person one of our choice and can't wait to give it a whirl!